Villa UJV 282 is an old Swedish home from 1870, recently rebuilt with respect of the same architectural style and design. It was occupied by the island's only Doctor, Louis Vialenc, for the years of 1940-1960. 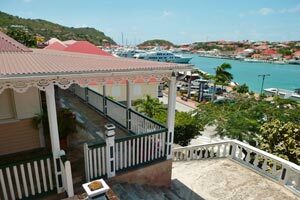 The house overlooks the Gustavia Harbor, and is perfect for watching the yachts come and go. The large wraparound terrace provides an ideal setting for evening cocktails and sunsets. Villa UJV 282 is walking distance to restaurants, shops, and nightlife is an added bonus. During the Bucket or Les Voiles the villa rents for the holiday rate of $10,290 per week.